To walk my street, alone at 12:30 a.m., is exhilarating, which isn’t the emotion I should be striving for at this hour of night, but when one can’t sleep… I had awakened to the dripping of rain off the eaves and couldn’t get back to sleep, so finally pulled on a coat, hat and scarf and walked outside. The trees are dripping and the streetlights glitter on the grass. Our cat crawls out from beneath the minivan and meows before slipping into shadow. 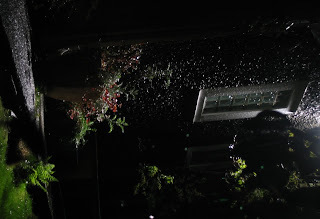 I walk through the steady patter of rain hitting pavement, the occasional plink of a heavy drop falling into the gutter, the gurgle of the two outdoor fountains from the house four east of mine. I walk through patches of darkness and then into the glare of a streetlight, allowing the neighbor’s dog to spot me from its front window and bark furiously through the glass. I listen to the faraway whistle of a train, the whir of cars speeding down Pyramid Highway, my breath as a contraction seizes my belly. I walk up and down the middle of the street, forgoing sidewalks because the shrouds of shadow make me nervous. I am a horse at the track, warming up for the big race, steadily finding my pace as contractions grip and release. Two, three, four times, I walk along this stretch of H Street between G and 4th. H for home, for hope, for hurry. The rain lets up and I come inside for a mug of steamed milk with sugar and nutmeg, my eyes heavy and ready for sleep. I found your blog from the link on Kyna’s blog. I already love it!